The average cost of memory care in Georgetown County is $5,500 per month. This is higher than the national median of $4,650. Caring.com has helped thousands of families find high-quality senior care. To speak with one of our Family Advisors about memory care options and costs in Georgetown County, call (855) 863-8283. Georgetown County in South Carolina is home to 60,158 residents, with 19.8 percent of those residents being seniors aged 65 or older. Some of those seniors may be among the 89,000 seniors in South Carolina who are living with Alzheimer’s disease or other forms of dementia, a number that is expected to grow by 34.9 percent before 2025. There are three memory care facilities in Georgetown County to support these seniors. In South Carolina, including Georgetown County, memory care facilities are called Assisted Living Facilities (ALFs) and Community Residential Care Facilities (CRCFs). These facilities are regulated by the Board of Health and Environmental Control, Division of Health Licensing. Crime rates in Georgetown County are higher than the national averages. On a scale where 100 represents areas of high crime, Georgetown County ranks 49.9 in violent crime, over 19 points higher than the national average of 31.1. The area also ranks 47.6 in property crime, compared to the national average of 38.1. Families thinking about relocating to the area might want to take the crime rates into consideration. 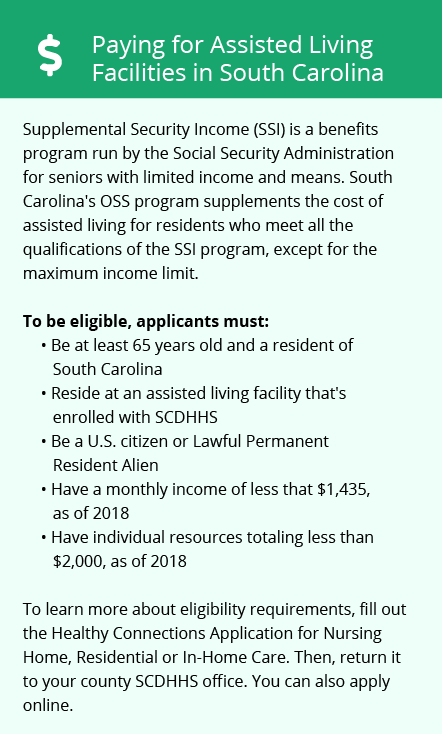 Seniors in Georgetown County are partially taxed on their pension and retirement savings account withdraws, but social security income is not taxed. South Carolina’s tax laws could help seniors on fixed incomes have more money to put toward their healthcare. The cost of living in Georgetown County ranks 99.9 and is almost on par with the U.S. national average of 100. However, groceries, healthcare and housing all rank higher than the national average. Families hoping to relocate to the area to be closer to a loved in care might want to take the higher costs into consideration. Despite Georgetown County receiving 52 inches of rain per year, much higher than the national average of 39 inches, the county only receives one inch of snow each year and gets 211 sunny days annually. Memory Care costs in Georgetown County start around $5,500 per month on average, while the nationwide average cost of memory care is $4,799 per month. It’s important to note that memory care rates in Georgetown County and the surrounding suburbs can vary widely based on factors such as location, the level of care needed, apartment size and the types of amenities offered at each community. Learn more about these programs, plus who’s eligible, on our Memory Care in South Carolina page. For more information about different ways to finance memory care, visit our Memory Care in South Carolina page. Georgetown County and the surrounding area are home to numerous government agencies and non-profit organizations offering help for seniors searching for or currently residing in an assisted living community. These organizations can also provide assistance in a number of other eldercare services such as geriatric care management, elder law advice, estate planning, finding home care and health and wellness programs. To see a list of free memory care resources in Georgetown County, please visit our Assisted Living in South Carolina page. 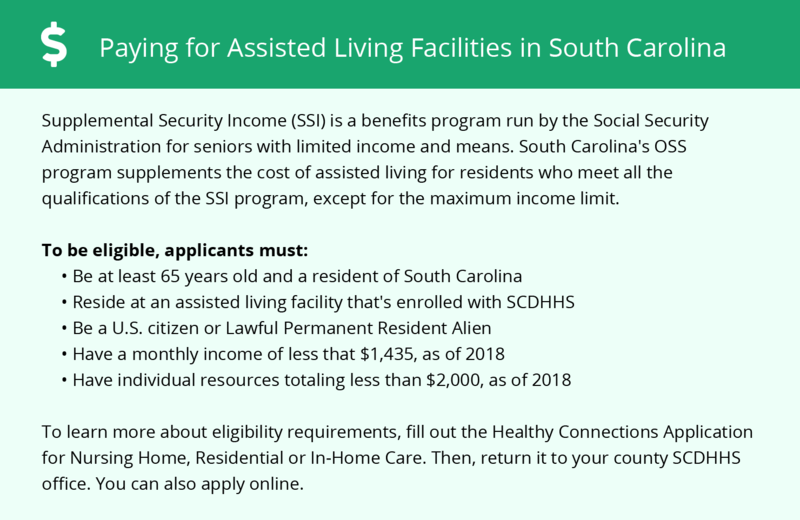 Georgetown County-area assisted living communities must adhere to the comprehensive set of state laws and regulations that all assisted living communities in South Carolina are required to follow. Visit our Memory Care in South Carolina page for more information about these laws.